The San Diego Fleet will seek their fourth victory in four games at SDCCU Stadium when they play host to the Birmingham Iron Sunday, hoping to reduce the errors from their last game. Martz said another goal is to “run the ball effectively” after being held to a season-low 31 yards on 23 carries against the Stallions, an average of 1.3 yards per carry. The previous low was 99 on 16 carries in the season-opening 15-6 loss at San Antonio Feb. 9. The game is a matchup of 3-2 teams. The Fleet have won three of four games following their season-opening loss. Birmingham has lost its last two games after a 3-0 start. Birmingham uses a “30” defense, which uses three lineman and four linebackers instead of the customary four linemen and three linebackers. The Iron have allowed 64 points, the fewest in the Alliance of American Football. Lewis declined to say who his starting quarterback would be because “that would be giving away strategic information,” but said both Luis Perez and Keith Price would play. Perez, an alumnus of Otay Ranch High School and Southwestern College, both in Chula Vista, has been the starter each game, but was replaced by Price with 44 seconds left in the first quarter after throwing an interception that was returned for a touchdown and gave Orlando a 14-0 lead en route to a 31-14 victory. Perez did not play on the varsity at Otay Ranch, quitting because the coaches frequently changed his positions. He began the 2013 season as the ninth of nine quarterbacks on Southwestern’s depth chart, became the starter the third game of the season after injuries knocked out two quarterbacks and started about the half season until being sidelined by a leg injury. Perez was an all-conference selection his second season at Southwestern, then transferred to Texas A&M-Commerce, leading the Lions to the 2017 NCAA Division II national championship and received the Harlon Hill Trophy as the top Division II player. Perez signed with the Los Angeles Rams as an undrafted free agent in 2018, played in their final preseason game, was cut before the start of the regular season and was on their practice squad from Sept. 2-18. “Some of these guys he’s playing against are a little big quicker, stronger and faster than the guys he played with at Texas A&M-Commerce,” Lewis said. “He is adapting to that speed and quickness. Some of the throws he may have gotten away with before they may not be there now. Price completed 18 of 29 passes for 234 yards and one touchdown in his first action of the season, outside of three 2-point conversion attempts in the opening three games. 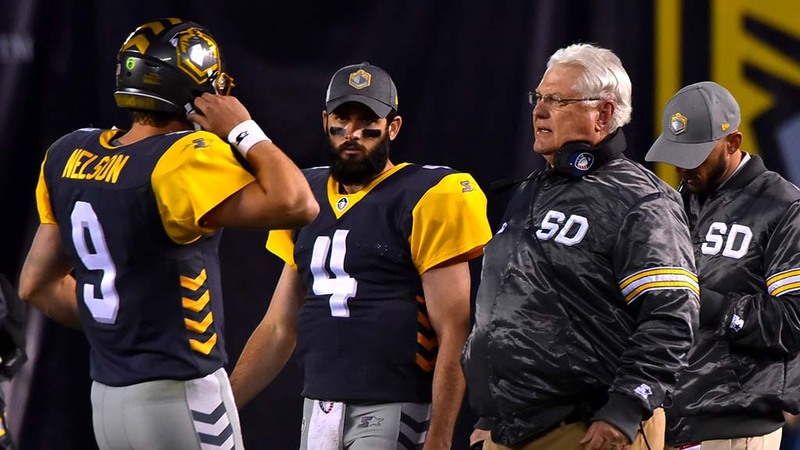 The Fleet announced on Sept. 5 they had signed Price, but they opted not to protect him for the league’s “Protect or Pick” quarterback draft. He was not selected in the draft and signed with the Iron on Jan. 16. Birmingham chose Perez with its first-round pick, the fifth overall selection. The game will also be a homecoming for a second Iron player, kicker Nick Novak, who kicked for the Chargers from 2011-2014 and seven games in 2017 after their move to Los Angeles. “It’s going to be a lot of fun being back in a familiar environment,” said Novak, who continues to live in San Diego, regularly passing SDCCU Stadium on the way from his home to a workout. The Fleet have two starters listed as questionable, meaning it is uncertain whether they will play — middle linebacker A.J. Tarpley and offensive lineman Damien Mama. Tarpley has missed the past two games because of a back injury. Mama was sidelined for the March 9 game because of an ankle injury after starting each of the first four games. Birmingham right guard Korren Kirven will miss the game because of a injury to his left calf after starting each of the first five games.